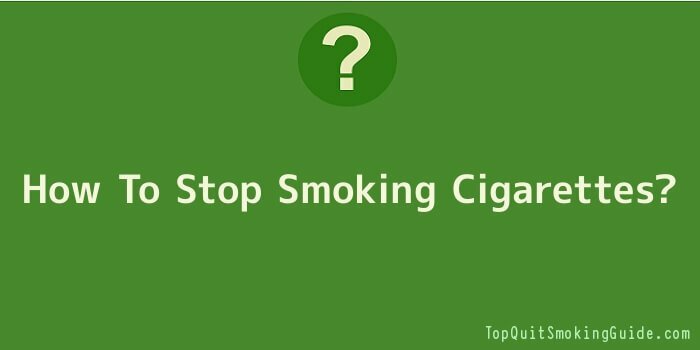 How To Stop Smoking Cigarettes? This is reinforcement on how to stop smoking cigarettes and stay quit. There are two (2) modes after quitting which contain the most difficult cravings to combat. The first one is the most obvious: The mode of being a freshly quit cigarette smoker and withstanding the urge to smoke in the first week. The second may not be so apparent; it is that of having been quit for a while and getting a sudden ‘good idea’ to just have one (1) cigarette to ‘calm your nerves.’ We find ourselves in quite a vulnerable position after we’ve been quit for some time. We seem to believe that we somehow have control over the disease of addiction. What we don’t realize is that our nicotine addiction has been getting stronger behind our backs. All it takes is ONE cigarette to not only quickly begin smoking as much as you were before you quit, but – in all likelihood – increase the volume you’re smoking on a regular basis. The most dangerous state of mind for a smoker is a logical mind which is able to rationalize smoking a cigarette after having quit. So how do we remain smoke free during these difficult times after we learn how to stop smoking cigarettes? The most important thing to remember in your first days as a non smoker is: Every time you give in to a craving and take even one (1) drag it gets harder and harder not to. The best thing you can do for your quit is to stick to your quit date and not inhale so much as one (1) puff of a cigarette. Remember, too, that cravings are relatively brief, and if you can make it through the first thirty (30) seconds, then you can make it ten (10) more minutes, thirty (30) seconds at a time. It’s vital to keep in mind that – although you are not actively smoking – you suffer from a deadly disease of nicotine addiction which will never go away. No matter how long you spend without smoking cigarettes, you ARE NOT cured of your addiction. You may convince yourself you are different after having a cigarette once and not thinking about it much the next day. The reality is, though, that you WILL be thinking about it, and you WILL give yourself permission to have another one at some point. After that, it’s only a matter of time before you’ve forgotten all about how to stop smoking cigarettes. If you took the time to invest in emotional recovery from nicotine addiction, don’t forget the peace of mind you found to help you quit smoking. Try to remember not to let the stress of life eat away at you. Take time to meditate, and remember to keep your side of the street clean in your personal and professional affairs. When you act contrary to your higher self, try to remember that it’s okay to admit it and say, “I’m sorry.” We smoke because we are generally not comfortable feeling as wide a range of emotions as is available to the human heart. The more comfortable we become in our dealings with ourselves and others the more easily we will be able to accept the reality which surrounds us and our feelings as we experience them. Don’t forget your initial lessons for the basics on how to stop smoking cigarettes: Stay physically, spiritually, and emotionally healthy; so smoking a cigarette never sounds like a good idea.